Don't you wish old photos could talk? That's the fascinating thing about genealogy to me...the names and the dates are pretty dry. I want to know the story of the person! For instance, here is my 2nd great grandmother, Hannah Maria South Baker, my grandma's grandma who lived near her during her childhood in Redwood Falls, Minnesota and was the one responsible for inspiring a lifelong interest in genealogy in my grandmother. Well, I know her name and her lineage going many generations back and much about members of her family, particularly about her husband, John Baker's history and ancestry. But I wish there was someone who could tell me about her first, short lived marriage at the age of 19, in 1864 to a reverend's son by the name of Eugene A. Prink. The marriage lasted less than two years, because in 1866 she married my great great grandfather, John Baker. They were happily married until his death in 1910. I don't know if her marriage with Eugene ended in divorce or annulment or what precipitated it. Eugene and John both fought in the Civil War. Eugene moved around the state of Wisconsin for years and seems to have never married again. He died in a Civil War Veteran's home and was buried on their premises at a ripe old age. In the photo below, Hannah is seated on the right. John Baker is seated on the left. 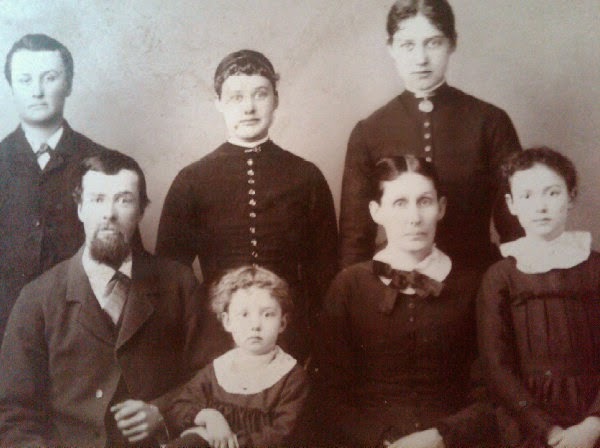 My great grandmother, Mary Helen Baker is the tall girl standing behind her mother.